How to find a cheap Florida beach vacation rental. Accomodations are the biggest expense on a beach vacation (unless you are flying from afar and have a steep airfare). You can spend $6,000 a week to rent a big beach house, or you can find a more modest beach cottage or motel for $600 a week. You just have to look around. CHEAP is $69 per night or less. MODERATE is $70 to $150. EXPENSIVE is more than $150 a night. INSANE is $250 or more a night. To save money, travel during the slower times of the year. Rates are a lot lower during October / November, and May / June, than they are during the rest of the year. In the panhandle, rates are lower October through February. October / November and May / June are excellent months to vacation on both coasts of Florida. But I will admit that January February and March are pretty chilly up in the panhandle. Getting a room at the Hilton may make for a nice beach vacation, but it will hit you hard in the wallet. A number of popular areas have plenty of reasonably priced hotels--some right on the beach. Try Cocoa Beach, Daytona Beach, Fort Myers Beach, or St. Pete Beach. These are all popular beach vacation spots with a wide selection of cheap to moderately-priced hotel rooms. Sure, staying right on the beach is grand, but you can save a ton of money by just getting a room across the street from the beach, or even a block or two away. The beach will still be within walking distance. A $110 hotel room 2 blocks from the beach can often be a lot nicer and more comfortable than a $179 room right on the beach. When I needed to do some research on Sanibel Island, I got a fantastic room at a hotel that was a 15 minute drive from the island. It was an absolutely gorgeous hotel for $79. I was thrilled. Sure it was less convenient than staying on the island, and with a little research I could probably have gotten 3 nights on the island for $110 per night, but I only needed one night and the price was right. I've done something similar in many areas. There are lots of islands where you can stay off-island and be within a 10 minute drive of a great public beach access. Sure those big sleek hotels on the beach with rows of umbrellas on the sand and tall palm trees just ooze comfort and convenience, but you might as well hook up the vacuum cleaner to your bank account. How can I relax when I know that the hotel is going to nick me $3 for a bottle of water, or where the dinner buffet in the hotel restaurant is $45 per person? Or how about that valet parking thing. First they charge you $15 a day to park your car in a remote lot, then you have to tip the valet every time you need your car. What a racket! No, give me a basic hotel with a little empty fridge, a microwave, and a decent wireless internet connection. I'll drive my car right up near the room, park in the free parking lot, and unload my gear (no waiting for a bellhop, thanks). I'll stock my fridge with cheap but healthy goodies I bought at the grocery store and hit the beach, bank account still intact. The (formerly) Holiday Inn Cocoa Beach is right on the Atlantic Ocean. I've stayed there several times for around $100. They have several restaurants at the hotel, but I never ate there. Why would I? There's a perfectly good Denny's across the street, a Slow and Low Barbeque 10 minutes away, and numerous other excellent (and cheap) places to eat nearby. There are also some more expensive restaurants, should you care to splurge. Just to show you I'm not a total cheapskate, I don't mind going for one higher-end meal at a nice restaurant, if it comes highly recommended. One of my favorite islands in all of Florida, Anna Maria Island, has some excellent smaller accommodations. And, since this island is largely residential, most restaurants cater to locals, and the lower prices reflect that. The White Sands Beach Resort is a nice little resort in a quiet area that has a variety of rates and room options, some of them are quite low. Cedar Cove Resort and Cottages, in Holmes Beach, also has some attractive rates in the October/November timeframe. Both of those resorts are right on the beach. Watch out for areas of the coast that have become completely taken over by condominiums. I ran into this on the Atlantic Coast around Indialantic, Melbourne Beach, Sebastian, and Vero Beach. There were very few hotels on the beach, and the ones we found were a bit pricey. We ended up at a hotel across the 4-lane highway from the beach. The price was O.K., but the hotel catered to out-of-town construction workers that lived there long-term. It was adequate, but nothing more. Ants were everywhere. One night was enough for us. It is important to know that not all stretches of beach in Florida have an abundance of hotels. Some have private homes and condominiums. You can rent a condo, but usually not for less than a full week. There are also various guesthouses and mom-and-pop style hotels near the beach in some areas, but let the buyer beware. Since each owner's maintenance standards vary, you'll want to get personal recommendations if you are going to go that route. Turning back the sheets to find a big roach hiding under the covers is not the way to start a vacation. If you are exploring a section of the Florida coast where there are few hotels, the easiest way to get a good hotel room is to get off the Interstate at a major exit and locate a hotel nearby. Use that as your base, pack up your beach gear and start exploring the public beach accesses and state parks. If you don't mind waiting to book an accommodation up until a few days before you depart, consider last minute timeshare rentals from websites such as SellMyTimeshareNow.com. Owners will price their units way below normal pricing because they want to make sure they can get some money before their week comes and goes for the year. So you'll sometimes find full weeks going for $60 a night at some of the nicest timeshares in Florida. Florida timeshare rentals are usually found within popular resorts owned by Marriott, Wyndham, Hilton and Westgate. They can offer concierge services, multiple pools, on-site dining, entertainment, shopping and golf courses. If you find one on the Florida Panhandle, chances are they'll be directly on a private beach. The timeshares themselves can offer 1, 2, 3 and sometimes even up to 4 and 5 bedrooms, so they are an excellent choice for large families or groups of travelers. If you can find a last minute deal, booking a Florida timeshare may save you a ton of money, and you'll also be able to enjoy all the comforts of home, and more. Lots of people have this fantasy of setting up camp right on the beach in Florida. This can be very difficult. The only places I can think of right off the top of my head where you can do that are on Canaveral National Seashore (during the winter months), and Long-Key State Park in the Florida Keys. Most state parks and campgrounds near the beach do not allow either camping or fires on the beach. The campgrounds are located behind the dunes, where you often cannot even see the water, although you can probably hear the surf, at least on the Atlantic coast. Even on Cayo Costa State Park, the campground is not directly on the beach sand. If you are into real camping, that is, camping in a tent in a state park, it can save you quite a bit of money. State park overnight fees for tent sites are generally less than $15 per night. If by "camping" you mean driving your 30 foot RV around, well, you already know how expensive it can be to park that baby overnight. The beach hotel lives in a harsh environment. Constant wet salty breezes saturate everything with a layer of corrosive salt spray. Things rust fast. All year thousands of tourists track sand and water in and out of their rooms, leave wet bathing suits hanging over the back of chairs, and bring dripping wet beach gear into the room. Tub drains fill up with sand, slowing drainage, and air-conditioners strain to take the humidity out of moisture-laden air. The fast turnover of hotel rooms during the busy season wears out sheets, towels, and furniture and stretches the capacity of the service staff to the limits. Only the most expensive hotels are able to keep their properties maintained to the highest standards. So if you are staying in a cheap to moderately priced hotel, lower your expectations a bit. You are here to enjoy the beach. Don't freak if the carpet is a little worn, or has a stain. Is your hotel too noisy? Neighbor's TV too loud? Kids running down the hall? Pool party going on all night? Housekeeping staff banging around at 3am? Who cares! Get yourself a pair of cheap foam earplugs. Stick them in your ears when you want quiet. I guarantee you'll sleep like a rock! Mostly. Get out and enjoy the beach! If you are like me, you don't have an unlimited budget when it comes to taking a beach vacation. 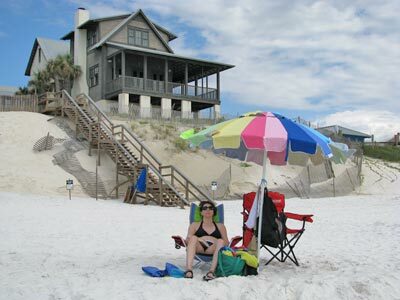 There are some things you can do to save a ton of money and still enjoy a nice vacation on a Florida beach...read more. I've got a few strategies I use to cut my costs when I stay at the beach, which is pretty often. Picking the right time of year, knowing where to look, having the right expectations, picking the right location, and lots more...read more. Ya 'gotta eat, right? But you don't have to pay through the nose. Take it from an expert cheapskate beach bum like me and know your options!...read more...read more. I've lived in Florida all my life, and my general rule when it comes to fun stuff to do is this: The less it costs, the more fun it is!...read more.